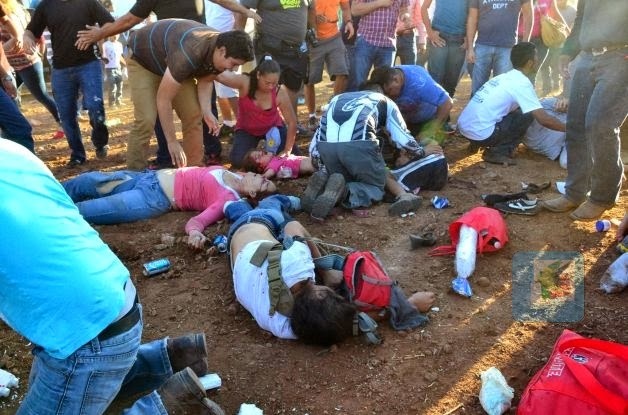 CHIHUAHUA, Mexico — An out-of-control monster truck shot into a crowd of spectators at a Mexican air show, killing at least eight people and hurting 80 others, dozens seriously, officials said. 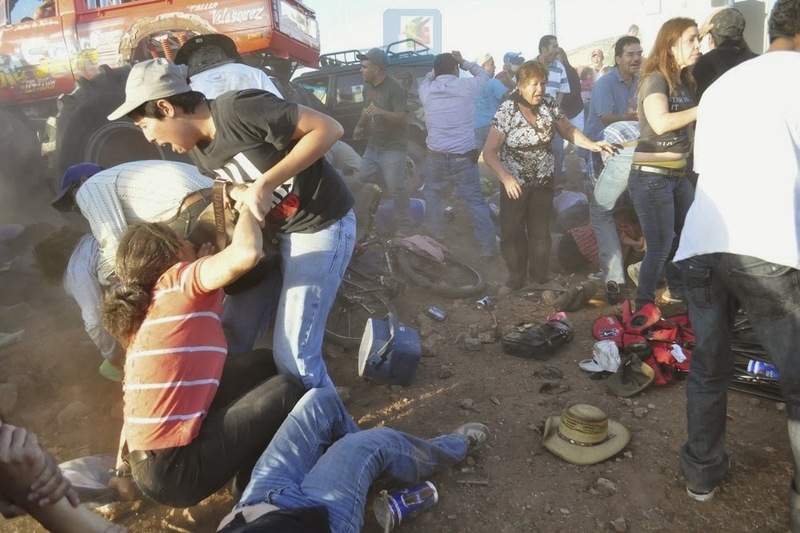 A monster truck rams into spectators during a monster truck rally show at El Rejon park. 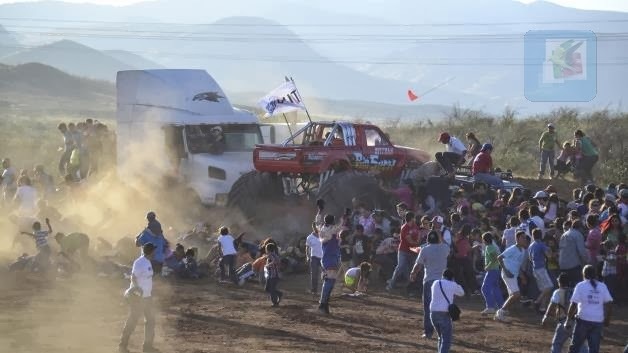 Carlos Gonzalez, spokesman for the Chihuahua state prosecutors' office, said the driver appeared to have lost control of the truck after leaping over a pile of cars it was crushing during a demonstration at the "Extreme Aeroshow" on Saturday. 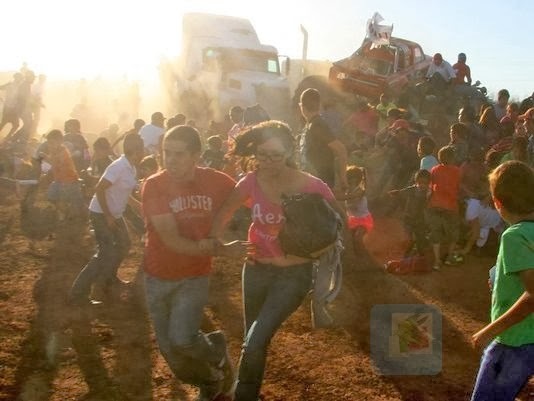 Some witnesses said the driver appeared to have hit his head on the interior of the truck as he drove over the old cars, with at least two reporting seeing his helmet come off before the massive vehicle drove into the crowd of terrified spectators, who tried to flee. 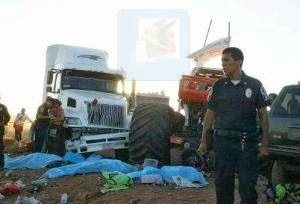 Gonzalez said the accident killed at least one child and hurt 80 people, 46 of whom remained hospitalized early Sunday. He said the number of dead and injured could rise as officials received updated information Sunday morning. The local health system listed the names of 67 injured people on its Facebook page, calling urgently for blood donations and help from local doctors and nurses. Gonzalez said prosecutors were looking into the possibility of a mechanical failure that left the driver unable to release the gas pedal. Several witnesses said, however, that the driver appeared to have become incapacitated when he struck his head during the show, in which the truck drives at high speed over smaller cars, leaping into the air as it crushes their roofs. The air show was canceled after the accident that happened during the second day of the three-day show in a park on the outskirts of Chihuahua, the capital of Chihuahua state.